There is a saying that every cloud has a silver lining. Sometimes it can be difficult to find, but it is generally always there. As the injury list at Aston Villa continues to mount, fans could be forgiven for worrying about the upcoming fixtures. However, there is a refreshing air of optimism around the club thanks to the emergence of a new generation of stars. As of this moment, Aston Villa are without 14 players who could realistically be considered for a place in the squad of 18. In the midfield, they are missing club captain, Stiliyan Petrov, who is set to miss at least three months with a knee ligament injury. In addition, vice-captain Nigel Reo-Coker is out for around three weeks, Steve Sidwell has recently undergone surgery on a troublesome achilles tendon, Fabian Delph is still missing after tearing his cruciate ligament last season, as is promising youngster Gary Gardner. In attack, Emile Heskey and John Carew are both missing, whilst Gabriel Agbonlahor made his return last weekend against Manchester United, but has withdrawn from the England squad through injury. Hopefully this is just a precaution, but it remains to be seen. Finally, Andreas Weimann, who made his Premiership debut in the season-opener against West Ham has been missing since August with ankle ligament damage. In defence, Carlos Cuellar, Habib Beye, Richard Dunne and Ciaran Clark are all suffering from various injuries, whilst their likely replacement from the reserve team, Nathan Baker, is also struggling from an unknown injury. Any club would struggle without 14 first team squad players. However, it has forced Gerard Houllier to give some of the younger players an opportunity to shine. And they have impressed. Most recently, they were magnificent against Manchester United and were unfortunate to lose concentration late on and concede two late goals. However, they will learn from this. Marc Albrighton has been one of the revelations of the season in the Premiership, and has already been tipped as a future England international. Barry Bannan has come into the centre of the midfield and received high praise from all around, culminating in a first international call after only three Premiership starts. Ciaran Clark, a central defender by trade, has been deployed in a holding midfield role and has not looked out of place. Comfortable on the ball, good in the air and tough in the tackle, he has a promising future. Having captained England at all levels up to U21, he has the potential to continue his impressive rise. 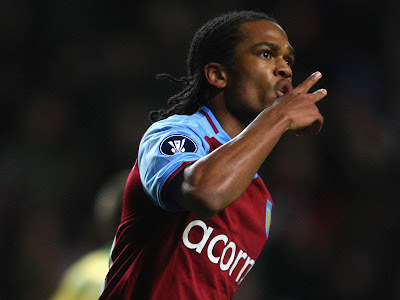 Nathan Delfouneso was given his first Premiership start against Fulham and scored his first goal of the season against Blackpool to give Villa a 2-1 lead. Jonathan Hogg made his Premiership debut against Manchester United and had a solid game in the centre of the midfield. Fullback Eric Lichaj and midfielder Chris Herd have also made their Premiership debuts in recent weeks. We may see further debutants in the coming game against Blackburn. With the injury to Richard Dunne, we may see young Australian defender Shane Lowry making his Premiership debut after a spell on loan at Leeds last season. This first team experience can only benefit these young players. So far, they have been some of the outstanding players for Aston Villa this season. Many of them have played together in the very successful youth and reserve sides – a potentially key factor. A winning mentality is something that cannot be taught. Players and teams that are used to winning have that edge, and tend to continue winning. Players that haven’t experienced winning sometimes lack that extra something. Virtually all of the young Villa players have tasted repeated success in the past. The reserve team has won the Premier Reserve League South for three straight seasons, winning the overall title in 2009. The year before, the group won the academy title, reached the semi-final of the FA Youth Cup and won the prestigious Ergenzingen Tournament. Just behind the current graduates are another promising group. They include 18-year-old goalkeeper, Benjamin Siegrist, who won the Golden Glove award as Switzerland won the U17 World Cup last year and Gary Gardner, who has represented England at U16 and U17 level before suffering a serious knee injury last season, and who has already been linked with a move to Inter. Academy captain, Daniel Johnson, has found himself in the 18 for the senior team in the last two games. Two other names to keep an eye on in the coming years are Courtney Cameron and Samir Carruthers, who have impressed for the academy side this season. Fans love to see their own academy products succeeding in the first team, and it is this pride that it the source of the optimism around Villa Park at the moment. Not only are they holding their own in the best league in the world, they are turning heads throughout the league. Back here in Australia our football leagues have a salary cap so when the cycle for your club is on the downturn, you are pretty much forced to build with youth and more often than not they are successful. I believe Villa should take the route - make sure they keep their talented youngsters away from the Man Us, Chelseas and Man Citys and use that as a foundation. Then make smart moves in the transfer market to pad out the team. It's exciting times ahead if we can get them under long term contracts.